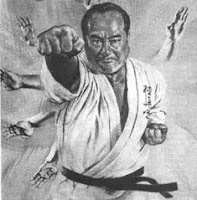 My recent article about Ed Parker's basics in 1963 provoked a storm of protest and understandably so: he is the "senior grandmaster" of practically all kenpo lineages in America. It seems sacrilegious to call his technique into doubt - even in 1963. Well in fairness to Ed Parker, I did find some footage of him kicking in his later years - it looks like the '80s - and I have to say the kick is perfectly functional. In fact, he breaks some boards (something Parker seems to have done quite well) and the kicks and punches were well up to the task. So I post the video by way of "atonement" for my comment that I doubted his technique would have improved in later years. It clearly did. Whatever one might say of Ed Parker, he was not one to rest on his laurels as I had so dismissively (as well as rashly and unfairly) assumed. But if there is any "silver lining" in this whole debate it is this: a discussion has ensued about the specifics of the front kick. I feel this discussion has been very productive. Parker is clearly no longer holding his hip back in the above '80s video. Indeed, I doubt he would have been able to break the boards had he used his 1963 technique. Instead, he is clearly using his hip - throwing it into the kick as one would expect, and doing so fairly optimally. It might be academic as regards Parker, but all these points are quite interesting and I thought they were worth exploring: what makes me so sure that particular requirements are important to a good front kick? "The karate hip thrust is excessive"
You can overdo the whole "hip thrust" thing. But that doesn't mean the hips should held "square" either. To do the latter is simply unnatural. There will always be some hip use, even if it isn't large. In other words, you don't have to "thrust" maximally - but nor should you "pin" your hips back like the 1963 footage of Parker and his student. Kicking with the hip held back is not part of Okinawan karate - much the same as punching with the shoulders "square" (ie. as if pinned back to the wall) is not standard (and is completely ineffective). 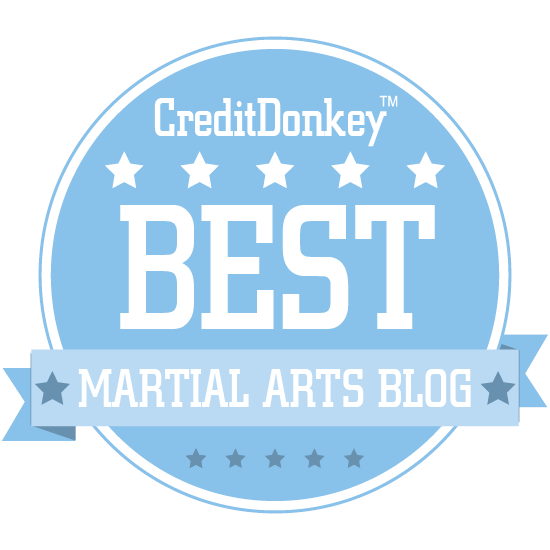 I say the above despite the excessive emphasis modern karate and other combat arts place on "power" kicks (as opposed to more conservative "snap" front kicks). Regardless of the "power", the hip is always used (ie. "thrust" into the action) to some extent. 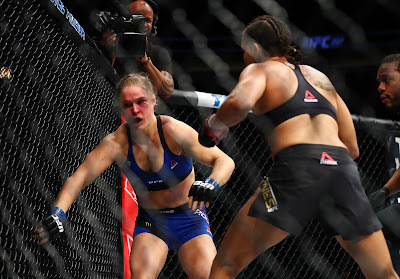 For a short, snapping kick this is less than for a deep penetrating front thrust kick at full range. But it is still there. In this respect the hip is to the kick exactly what the shoulder is to the punch: it can't be divorced from the movement. The standard kick no more "pins the hip back" than the punch "pins the shoulder back". "The shoulder should be relaxed and rounded, however you should not be leaning into the punch (your shoulder position is identical to that when you are doing push ups - see my article "Punching: alignment and conditioning")." 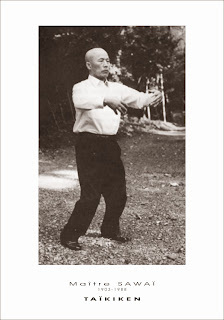 Some shotokan schools have placed "aesthetics" over practicality and do basics with the shoulder "pinned back" (see the fairly typical basics photo above). But it's interesting that even these schools abandon this artifice in actual application, as you can see from the adjacent picture. I wonder whether Parker was simply following an orthodoxy of his era, only to abandon it when actually having to kick something... This would explain the hip actually being used in his board breaking. "You don't thrust your hip when you walk"
Others argued that you don't thrust your hips when you do other activities like walking - so why would you do it when kicking? Well first, walking and kicking are very distinct actions. Second, you don't hold your hips back when you walk anyway - never mind when you run. They naturally move into the action. If you look closely at the adjacent drawing you'll clearly see the hips are not at right angles to the ground or even each other. The angle is quite obtuse. This means the hip has been "thrust" forward on the lead leg and "thrust" backward on the rear leg. This shouldn't come as any surprise: your hips are the "set of power". No technique is possible without using the hips to generate force - least of all kicks. 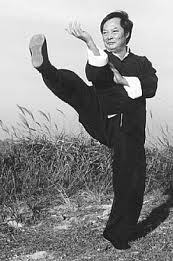 Some argued that it was consistent with the "old way of kicking in karate" where the foot was not meant to pass the line of the fist. The "old style" kick to which you refer is the tsumasaki: a toe kick. Because it isn't a "power" kick, it finishes with the knee bent (as I've just said) in a short snapping movement, and together with a punch. This is not what I see Parker and student doing. You can see from the picture below that the hip is moving forward naturally - not being held back "square". Anyway, I should point out that the tsumasaki is by no means accepted as the "original" or "old" way of doing standard kicks in karate. As Jesse Enkamp validly points out, there is good evidence that the latter is a myth. I think the tsumasaki was almost certainly only an occasional/rare technique. It wasn't the basic, standard that you'd show in demonstrations of punching and kicking. So even if it uses less hip than a standard kick (whatever that is), it would be very implausible to say that in 1963 Parker was doing his kicks poorly because he was doing it some "old way". 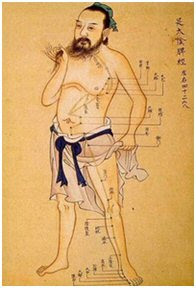 "Chinese arts don't use the hip"
I have studied multiple Chinese martial arts and none kick with the hip held back. I've never seen this taught as "standard" or "correct form". Rather, the hip is always employed in some fashion in kicks used in Chinese forms. 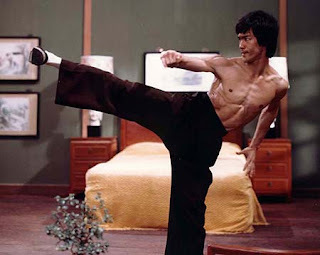 It doesn't matter whether it's a heel kick, toe kick, groin kick or any other variety: the result is always the same. The Chinese arts can be very performance-oriented: elegance matters. This is especially so in wushu. Techniques have to not only be powerful - they have to look graceful and powerful. You can't achieve that result without using your hips. Aside from using less thrust for certain "non power" kicks, the principle of using the hip doesn't change. 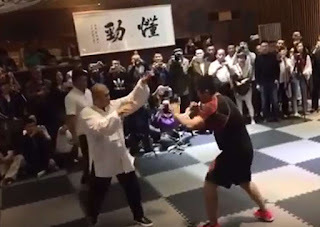 The way Parker and his student demonstrated the front kick in 1963 is directly opposed to these principles - as any karate, gong fu, taekwondo, Muay Thai or MMA practitioner will tell you. But as I pointed out earlier, hip use isn't the only issue. Essentially kicks, like all techniques, benefit from good form generally - ie. solid mechanics. Well let's take kicking for example. Here's a video I filmed in October 2011. Bear in mind that this is just months after I herniated two discs in my lumbar spine while training in Taiwan. At the time it happened I never thought I'd kick again. Yet despite discomfort and compromise, I'm happy enough to film the kicks for reference here. And I'm 15 or so years older than Parker was in 1963. And I'm no "master" or "grandmaster". You'll notice that apart from details like the hip use, I'm watching my supporting foot, my arms, whether or not my body is rising or falling and whether I'm making any extraneous movement. In other words, I'm trying to move as efficiently as possible. It increases your efficiency and therefore your speed and force ("power"). Just ask a pro golfer or tennis player who hits a ball harder or faster; some young guy with poor form or some old bloke who has near perfect technique. It decreases telegraphing - which is what really counts in terms of not giving your opponent a heads-up about what you're doing, and therefore having a better chance of landing your technique. In fact, a lack of telegraphing makes more difference to landing a blow than any speed. 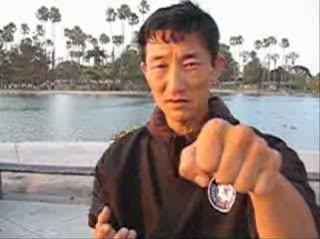 Good basic technique is essential in martial arts for the reasons I have recently discussed: they make you more efficient, economical and effective. These are the sort of "soft" skills that allow you to overcome "brute" force. 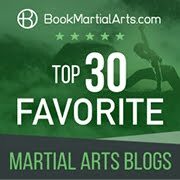 If my blog is occasionally critical of technique x or y as performed by someone it is entirely because I primarily write about this one issue: the importance of getting martial technique correct; of using "smart" fighting methods, not "hard" fighting methods; of using "the way of least resistance". "I am genuinely sorry to be so polemic. But I find that if I beat around the bush too much, my central point gets lost in polite discussion. Polemic works might state things a little strongly, but the point is clearly made and discussion can then ensue. It's important to note that I have not sought to attack schools or systems in the last few posts, so much as critically analyse techniques, tactics and pedagogies that have escaped any detailed observation in the past. I've outlined the reasoning for my conclusions in some detail. I can't constrain myself from analysing something I feel doesn't work just because of who it is that is doing the thing. In the end, I feel we have a duty to be honest - primarily with ourselves. 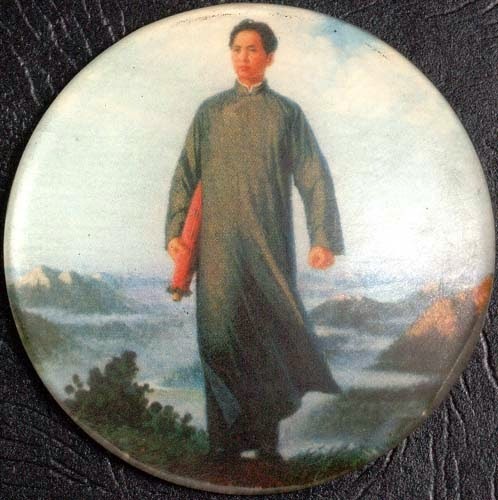 I see my role as a martial commentator to be frank and fearless. This includes saying things that aren't always popular (and believe me, the private mail I'm getting is nothing like your polite and considered response). Could I be more polite about these issues? Yes. Would I make my point as well? I don't believe so!" In Ed Parker's case, I think was too harsh in my overall assessment. While I regret this, I don't regret the discussion I have provoked. Because issues such as efficiency and economy gained from precision are just the sorts of "soft" martial issues I hold dear to my heart. And like it or not, these have been discussed quite openly - in relation to a senior grandmaster, no less - where otherwise they have been "taboo" for decades. I will probably continue to be a polemicist. I can't seem to help it. But if this offends you, please bear in mind my motives are not to "tear down" - but to argue for something I believe is important to us all.